The interview then appeared online in English and we found it and transcribed it for everyone. Tonight "Fantastico" TV in Brazil aired a clip of an interview with Axl and Duff. The interview then appeared online in English and we found it and transcribed it for everyone. Interviewer: I was reading that recently the band posted on Facebook, something, ironically saying hey thanks everyone who says, who tried to take credit for getting us back together, I'd like to ask you guys what was the real driving force that made you guys come back together again? Axl: Actually it had a lot to do with Paul Tollet of Coachella. He started talking about it, it seemed real, so at that point I just you know told my people that they could go ahead and start talking to people and see whats going on then as it became more real then I, I text Fernando and asked for Slash's number and then Fernando texts his Mom and she's like... If this is a joke... I'm Gonna kill you! Interviewer: But when you guys signed up for Coachella did you think at the time it was gonna be a one off thing and then only later it developed into a full tour? Axl: No, no.. it started with talking about Coachella but at the same time that those talks were starting there were people involved with Coachella, agencies and things. So, they were having these conversations about what they could possibly do or not, so it was all being considered. Interviewer: So both of you already had it in mind that well this might end up turning into a full blown tour? Duff: It was just you know, getting into rehearsals it was really just kind of like one day at a time, I don't know that I thought too much about how far ahead, it was just really cool to play some of the music with the guys I was playing it with. Interviewer: I've read comments you guys have made about the current state of the music industry and I have a question about that. 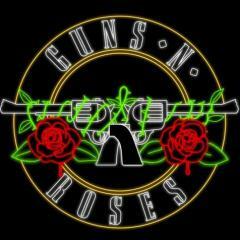 Let's say if you guys were let's say 17, in this day and age, exact same guys you were 30 years ago, do you think the whole environment of music, of the business... would allow a band like Guns N' Roses to be born? Interviewer: In L.A. You mean? Duff: On the West coast... I've seen a couple different places. Duff: Small, yeah. There's a place called "The Smell" and it's on skid row and it smells! It's five bucks to get in..
Interviewer: CBGB all over again? Duff: Yeah-ish, yeah... but kids take like Uber there..
Interviewer: Do you go out to see music, Axl, at all? Axl: Not lots, no, I'm not... Oddly I guess I'm not really a live performance guy. I'd rather watch sports on TV rather than most of the time then go to an actual game... I'd rather, they got like the close ups and all that so... I'll watch some things if it's filmed but I'm not so much seeing things live a whole lot. Interviewer: Talking about small venues, what was it like for you guys to be back at the Troubador and do a Guns N' Roses show? Axl: It was great for about a song and a half! When I broke my foot. Duff: He broke his foot, second song man. Interviewer: But you went on didn't you? Interviewer: Did you realize you had broken your foot? Duff: You said it.. ."I think I broke my foot"
Axl: I was pretty sure I did... you know my sister had just broken her leg a few months before and she made this comment... she goes... "You know when you break something!" You know... and all of a sudden on stage I was like she's right you do, you know! Interviewer: You guys are doing dates in November in Brazil, of course Axl you have these very strong Brazilian connections a whole family that's so close to you.... for those who are watching us who may not be familiar with that story could you sum it up for us, your Brazilian connection? NO, I met Beta like in '91 and her family and then we've been together in ways since then and Beta's been a big help with everything behind the scenes of Guns N' Roses and her family's been very supportive. Fernando has worked his way up in this business doing all kinds of things. With Guns N' Roses, but also with other companies and things... and been everything from baggage and wardrobe to being a tour manger and stuff. And doing the jobs well. He's also worked with all the managers I've worked with and learned from them and knows how to communicate with them. So it seems to be something that they like to be involved with... and it helps everything. Plus, they're a big family. I like the family environment, it helps keep things kind of insular. Interviewer: Cool. And I've heard talk of a possible new record, some new material. You've shown stuff to both Duff and Slash. For someone who comes from my generation, does it bother you that your new record might not be available phyiscally. That there might not be a real CD. That even if there is a real CD, people might only listen to it in a streaming environment? Axl: It doesn't bother me except in terms of if you're interested in the album art and stuff. In ways I can get it, I think in some ways there's not as many artists doing a lot with the artwork of the album that you can't just do in photos somewhere. Interviewer: But that's gone now. *To Duff* How to you feel about it? Interviewer: Duff you have collaborated over those years after Guns N' Roses split so to speak... You have collaborated with both Slash and Axl. But Axl and Slash haven't played together in a long time. I want to ask you what was it like the moment when you actually got together with Slash for this reunion? Was it at someone's house? Was it a phone call? What was it like, was it awkward? Interviewer: No, just being together like in the same room. Even before playing. Axl: Well I had asked for his number and then I'd called him and he was on tour or something and we set up when we going to see each other. Then I think something happened to both of our plans and it didn't happen. Then eventually in October we got together - we had a dinner at my house. Duff and I hung out after that a week or so after. And then it was just like talking and planning. Initially we were going to do some kind of promos and stuff, but then other things came up that got in the way of that. Then it was rehearsals. We went down to rehearsal, everything sounded right and we just went to work. Hearing what everything sounded like and just getting ready for the show... and it was all... working, you know? Interviewer: I just think that each one of you.. I mean the three of you, had to change a bit. Something has changed inside for this to be happening. Or again, do you think it ended up happening naturally to start with? Duff: I got to discover in the best of ways... the album Chinese Democracy that he made (pointing at Axl). And it was these song that' he'd worked on. you know I'd listened to the record, but when you start to play the songs.. as a player... you really discover everything under all the layers in the song. Duff: A lot of layers. But really kind of like how you hear and how I'm hearing the songs are maybe a little bit different. And I know that when we went into rehearsals, we wanted to really like.. own what we were doing. Y'know, this is what we were going to be doing. Axl: You know, I really didn't have anything to do with that. Its like, they stepped through songs on Chinese. *Duff nods* They asked which ones are you interested in us doing and stuff... and they stepped to that on their own. They started working with Frank because they had their own way of working with the drummer and working with the rhythms and kind of picked up the tempo on some of the old songs a bit and things like that. They got their communication working. They spent a good while at that on their own. Interviewer: You made reference to drumming.. that reminded me of Steve Adler. Is there any chance that Izzy and Steve might join you guys? I know that Izzy already played with you guys, but any chance Steve might join you guys later in the tour? Axl: No Steven did join us. Axl: Yeah it was Steven that joined us. Yeah you know... At the same time I have no idea. When this started, Steven had just had back surgery so... and um. I don't have any idea about that. And with Izzy... that's just something that I can't really.... describe. That's to say, I don't really know what to say about Izzy. It's like you could have a conversation and think it's one way and the next day it's another way. And I'm not trying to take any shots at Izzy, it's just that his thing is kind of his thing. Whatever that is, y'know. Interviewer: Well it's time to go. I just have one final question for you Axl... the split duties between Guns N' Roses and AC/DC.. Are you planning on doing that for quite some time now? Axl: I'll do that as long as Angus wants to do it and as long as we can make it work. Guns is really supportive about it. Axl: I love that it's my job. I love that Angus is my boss. And it's singing the uh... early Brian songs from the first couple albums... those are something else to sing. So it's physically a different animal and another kind of work. And I take pride in doing it. It's a hard thing in it's own way. So after this, it's a few days and I'll do another 10 shows with AC/DC. And after that, it's whatever Angus wants to do. Interviewer: What do you have to say to the Brazilian fans going to the shows in November, some of the shows are already sold out. What can they expect and what special recollections do you have of Brazil? You’ve been there quite a few times. Axl: All we have to say is… We’re coming! Axl: We’re on the way! Interviewer: It was not common for bands at their peak to go to Brazil. That was a very unusual thing, so that was such a big deal. Axl: I think it was Globo (Interviewer's company) that wanted us to come there. They spoke with our management about us going there. We were just really glad to do it, we were excited to be there.